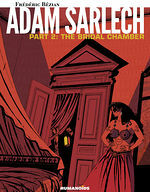 No one remains unscathed in this trilogy of mid-19th century-set interwoven tales exploring love, revenge, and death. An engrossing universe awaits the reader who dares go past the first page of this off kilter gothic saga, populated with a rich assortment of bizarre characters and haunting plots. Hints of Lovecraft and Poe abound as hidden secrets, the occult, succubi, spiritual séances, and repressed urges are interwoven in Frédéric Bézian’s award-winning literary and spectacularly dark fantasy. 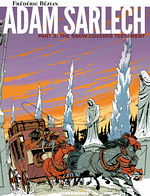 Adam Sarlech achieves what so many Victorian Gothic homages fail, and for that, it is a treat for any fan of the genre or for anyone looking for a more “literary” graphic novel. Plus, it is just too much fun to read and too beautiful to look at, so please do not miss out on what may be one of my favorite releases of 2016 thus far. It is all quite, quite mad, as are almost all of the players. Some of them have been mad for many more moons than you might initially suspect. 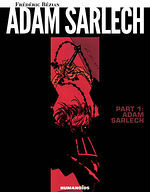 Adam Sarlech is a Choose Your Own Adventure book in which you have no real control – your hands and feet are tied to the track, but if you can wake from the nightmare in time, you just might escape dying in your sleep.